Asta and Yuno are two orphans who want the same thing: to become the Wizard King. Locked in a friendly rivalry, they work hard towards their goal. While Yuno excels at magic, Asta has a problem uncommon in this world: he has no powers. But, on the day they receive their grimoires, they surprise everyone. To reach their goal, they’ll each find their own path to greatness—with or without magic. Considering I watch quite a lot myself and I have a lot of friends who are in the ‘anime community’, Black Clover has escaped my radar. I didn’t know if this was a good or bad thing; it may have been a hidden gem, or there may have been a reason that no one was talking about it. Taking into account the recent successes of post-2010 anime, Black Clover is incredibly mediocre with the creators and staff making use of stock characters and conventional story lines. Immediately after 5 minutes of viewing, it was as if somebody had merged Fairy Tale and One Piece together with a dash of Naruto for good measure. Black Clover features the story of Asta and Yuna, two boys that have been brought up in a church orphanage after being abandoned at birth. Whilst everyone else has natural magical talent, Asta doesn’t, but surprise! 15 years later, they both grow up in Clover Town where anyone can cast magic with the aid of a spell book known as ‘Grimoire’s’. Fancy that. Asta, the main protagonist is consistently yelling and whining and just comes off as annoying. However, I am watching an English dubbed version, so do not know if the wailing is just as bad in the shows intended tongue. Whilst the animation is up to a high standard, the voicing is a little off in places. I feel as if I read the manga, I could enjoy this more as I could project my own voices into it. There is still no emotional attachment to him after a nearly a dozen episodes, and I think this is where the main failing is for me. Other notable characters include Sekke; (an arrogant classmate who deliberately picks Asta as his opponent during a duelling test to try and show him up. This however backfires when he produces a shield only for Asta to summon a sword to cut through it) and Yami; (the captain of the Black Bulls who finally decides to accept Asta as one of them) Whilst notable, again, these are just standard stock characters with just replaced names and hair colours. I get the feeling that the budget for this anime hasn’t been incredibly high, as whilst the magic and spell-casting scenes are great, they are a bit scattered across the season. I want this show to look promising and to improve, but I have only reached up to Episode 10 and I am still not really getting that excited. While I am intrigued about Noelle, who is the youngest sibling in the Silva household, but even her back-story and motivations are incredibly predictable. Bullied by her brother, insults thrown at her like “You should have died instead of mom”, Noelle struggles to contain the huge amounts of power inside of her. I am incredibly down the middle with this anime; it just feels like something I would watch as filler whilst waiting for Season 2 of One Punch Man. I know the potential is there, I know the character development is there, just I don’t know how many more episodes I have to watch to get somewhere. I do however love the ‘Clover Clips’ at the end of each episode (similar to ‘Sonic Says’ or ‘Sailor Says’) in which we are taught to use manners, respect elders, eat our veg etc. It’s a very nice nod to 90’s anime and cartoons in particular and I enjoy the nostalgia feel being it. All in all, Black Clover would make a good watch if you were introducing children or a friend to anime and the art style, but for fans, it delivers nothing that you haven’t seen in longstanding Anime offerings. 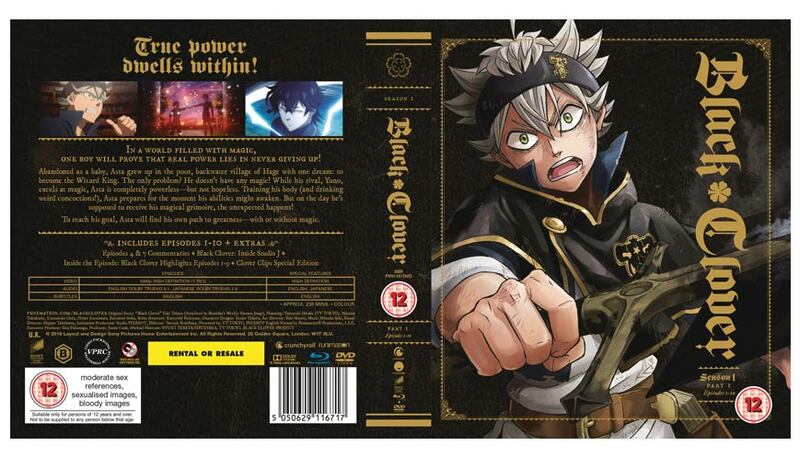 Black Clover Season 1 Part 1 is available now on Blu-Ray through Sony Pictures Home Entertainment and Funimation. If you're looking for a fresh new Anime, you're out of luck. Instead, Black Clover takes sprinklings of existing properties and plants the seeds of potential for a show which feels on the verge of sprouting its own identity.